The Advanced Plant Technologies (APT) programme, launched by DARPA, aims to develop “robust, plant-based sensors that are self-sustaining in their environment and can be remotely monitored using existing hardware”. This is needed, the agency explains, because threats are more distributed than they had been in previous decades and monitoring them has become too complex for the electronic and mechanical sensors that the defence sector conventionally uses. “Plants are highly attuned to their environments and naturally manifest physiological responses to basic stimuli such as light and temperature, but also in some cases to touch, chemicals, pests, and pathogens,” said programme manager Blake Bextine, a biologist specialising in insects who works in DARPA’s biological technologies office. Bextine’s vision for APT is to modify these natural sensing and response mechanisms so the plants respond to selected chemicals, pathogens, radiation and even electromagnetic signals in such a way that the plants’ ability to thrive in the environment is not compromised. The result would be sensors that are energy independent, stealthy and easy to distribute over a selected area. The programme will use synthetic biology techniques, Bextine said, and will develop an iterative system for designing, holding and testing plant-based sensors. This will involve going far beyond current practice in plant gene modification, which only makes slight changes to a few traits. 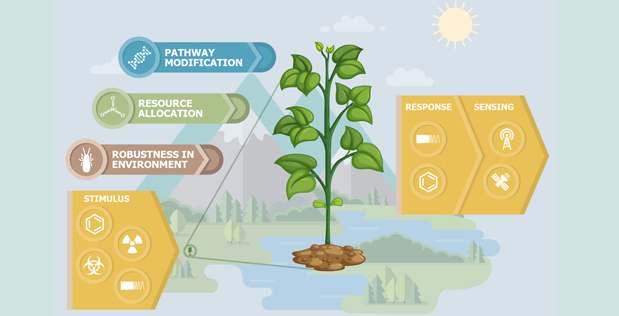 DARPA’s aim is to modify multiple and complex traits in the plant and will also address how the modified organism competes in the environment. Previous experiments in plants modification have reduced the plant’s fitness to thrive, but the APT project depends on developing plants that can cope with natural environmental stress factors such as microbes, animals, insects and other plants. Monitoring the changes in the plants induced by the substances they are designed to detect is also part of the project. It will not, however, involve developing new hardware for this, as systems that can measure plant temperature, chemical composition, light reflectance and body plan from a stand-off distance are already available. Initial work in the project will be confined to greenhouses, laboratories and simulated natural environments. Later phase field trials would take place in district biosafety protocols overseen by the relevant government agency. GM plants aptitude to detect hazardous substances: “it takes one to know one” as we say. So massive Genetic Modification and release into the environent, this is true biological madness! Does this programme share any techniques with earlier programmes that sought to decontaminate ground by growing plants that absorbed the contaminants? The plants could then be harvested and processed (e.g. heated in a sealed container) to extract concentrated contaminants. As I recollect it was hoped they would be effective with heavy metals in the soil.